This question was recently asked on Stack Overflow. Nowhere in the question does the OP request a specific programming language either, and only stated that it is to be used in Unity. Which has support for C#, UnityScript (A JS variant), and other C languages through dll's. I felt like this question was good enough to not flag it for deletion, so I went to the flag asking for migration. As I thought it would be a better fit for the maths exchange site, but since this is not one of the default option I did some research on how to handle migration requests for other SE sites. If you think so, you can flag the question for moderator attention and request that they migrate it for you. which also shows in the flow diagrams. And this answer also saying you can flag it for moderator attention. which got rejected with the message "declined - please use the standard close reasons to close questions, rather than the 'requires moderator attention' flags". The message struck me as slightly odd as I didn't request it to be closed (so wouldn't vote for it to be closed) but rather migrated. Note that I raised this flag before there was an accepted answer on it (which is there now, and which is a purely mathematical answer). Else it wouldn't be viable for migration already anyway. Was I wrong to use a moderator attention flag for this despite accepted resources pointing towards "acceptance" of custom flags for this? How should I have handled this? I'm the mod who declined your flag. Martijn sums up the reasoning for the declined flag. There's a few issues with migration I regularly come across. Flagging to migrate posts that are also on topic for this site. Flagging to migrate a post that is too old to migrate. 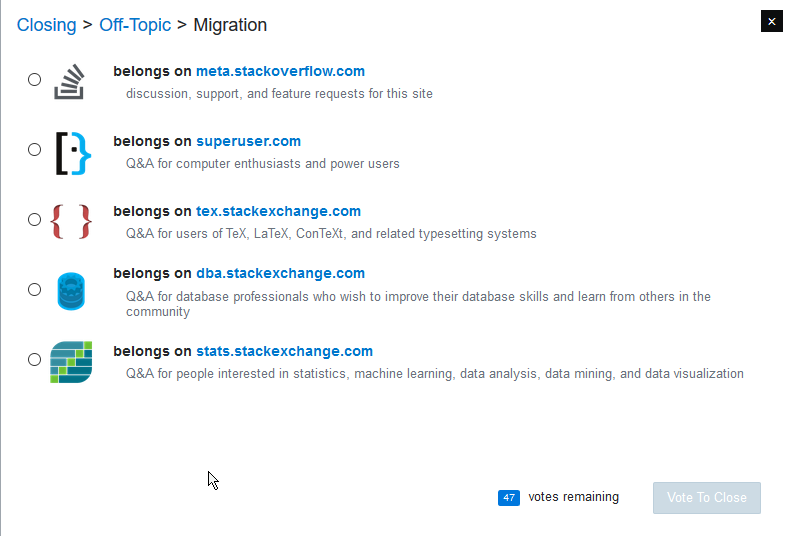 It's also worth mentioning, the Stack Overflow mods are often not experts on the target domain when requesting migrations. If the flagger is a high rep user on the target site, it's usually safe to migrate the question. If not and the question looks like it might be a fit for the target site, it involves talking to people on the target site and asking if they want us to migrate the question. If there's any doubt on that point, I decline the flag. Otherwise I'm wasting mod time for the target site also. So unless you have clear domain knowledge of the target site, it's wise not to flag for migration. Instead use one of the standard close reasons, that will bump a post into the review queues. This way the community can handle question closure, without the need for moderator attention. Custom mod flags should only be used when the standard site processes won't suffice. You only stated the question was off-topic here, which is nearly equivalent to the Close -> Off-topic -> Other close reason. Since there's an equivalent close reason to what you stated in the custom flag, the mod reviewing it declined the flag. Not the answer you're looking for? Browse other questions tagged discussion flags specific-question declined-flags migration . Why was this custom flag declined? Why was my mod flag to migrate a question declined?